Watch this informative video about planning your pool! At Elite Weiler, our reputation is built into every new swimming pool that we design and construct. The process of building a swimming pool requires precise planning and preparation to ensure that all requirements and deadlines are met on time and in accordance with your specific ideas for your swimming pool and spa. We take the time to make sure that you completely understand what to expect from our qualified staff of swimming pool builders and designers, all while delivering superior customer service and exceptional satisfaction. Before construction of your swimming pool begins, you will meet with us and talk about any pool design ideas you have in mind. We’ll work with you to determine what your best options are according to your budget and other requirements. After meeting with our expert pool representatives, an on-board pool designer will begin drafting blueprints and and drawings to show you precisely how the pool will fit into your property’s landscape. We will then stake out the pool so that you may “get the feel” of its dimensions. Only after both you and Elite Weiler’s construction manager have determined that the site has best met your needs and requests will we then begin the construction process. WANT TO KNOW MORE? 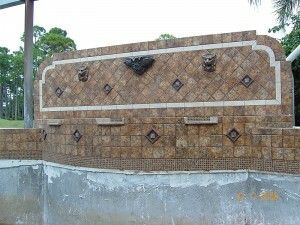 CALL (941)343-9001 TODAY AND SPEAK TO ONE OUR POOL DESIGNERS. 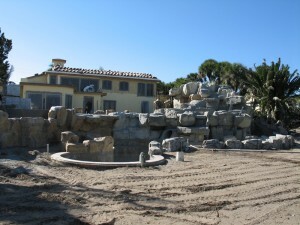 How Do We Build Your Sarasota Pool? Once you’ve approved the design of your swimming pool with one of our award-winning swimming pool designers, the design is submitted to the county for approval. The superintendent assigned to your job will then come out to the work site to verify all measurements to comply with the necessary regulations. Upon approval, the construction manager for your job will review the layout and construction can begin. Upon completion of the layout of your swimming pool, we will begin the excavation process, clearing the area to lay the steel reinforcements that will support your new pool. Rough plumbing is then installed, followed by a final inspection of the overall structure to ensure our high quality standards have been met. Gunite is a mixture of concrete and sand that is sprayed over the steel reinforced pool supports. This process lays the foundation for the shell of your swimming pool and is vital to the end result of your pool. Once the gunite shell has been finished, the deck area is graded and compacted to further reduce cracks in the concrete. The rest of the plumbing equipment is then installed and pressure tested to ensure that there are no leaks or malfunctioning parts. Our decking professionals will then start the process of forming your pool deck. Once the formation is done, concrete is then poured and allowed to cure. The deck crew will then apply saw cuts within a 24 hour period to reduce cracking. Depending on if you’ve selected coping for your pool or not, that will be applied before the concrete decking is poured. Our qualified pool builders will then install the tile around the perimeter of the pool at the 6 inch waterline row. Depending on the type of decking chosen, our decking crew will lay the appropriate acrylic or paver deck topping. All of the necessary equipment for the optimal performance of your pool is then installed. This equipment includes filters, pumps and other options available for your swimming pool. Upon the completion of your swimming pool, we will measure and install a pool cage and screening that will cover the deck and protect your swimming pool from the elements. Once the cage and screening process has been completed, the shell of the swimming pool is cleaned and prepped for the final installation of the pool finish. After the finish has been applied, the pool is then filled with water, helping the finish to cure. The pool is then brushed and chemical treatment is applied. 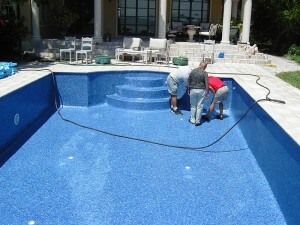 This process requires a minimum of 28 days of allowing the chemicals to balance and prepare the pool for actual use. If desired, a child barrier fence and/or alarm system is installed to prevent accidents involving young children. Our clean up crew will then clean your yard and prepare it for landscaping or further development. Your yard will be graded as well, according to the landscaping options. Once the final pool deck coating is applied and the chemical treatment applied, the pool is ready for use! The final step in your swimming pool is a 30-60 minute “course” on how to properly maintain your pool to ensure it functions properly for years and years to come. Pool School is done at your location by one of our professional pool technicians who will instruct you on the proper operation and maintenance of your pool. The technician will also provide you with a complete set of cleaning and testing equipment for use with your new pool. This service is offered to all of your customers free of charge! Guide to Pool Care. 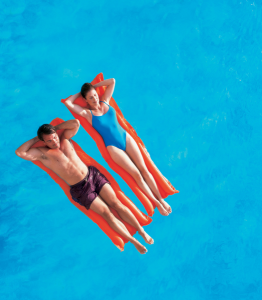 To get the maximum benefit and enjoyment from your pool learn how to care for it. By starting off right pool care will take the least amount of effort. HAVE QUESTIONS ABOUT OUR CONSTRUCTION PROCESS ? CALL US TODAY AT (941)343-9001.